Guess who returns to Seattle on Thursday, March 26th? Marilyn Manson, that’s who! The man and the band! The current tour, known as The Hell Not Hallelujah Tour (named after lyrics in “Cupid Carries a Gun,” (Better pray for hell, not hallelujah) finds Marilyn Manson touring the entire world. All of it. Manson is doing something right. Or something so dirty and wrong it is right. Or love him for no other reason than his clear affection for his cat, Lily (Lily has her own fan page on Facebook). His latest release, 2015’s The Pale Emperor (was there ever a more appropriate title? 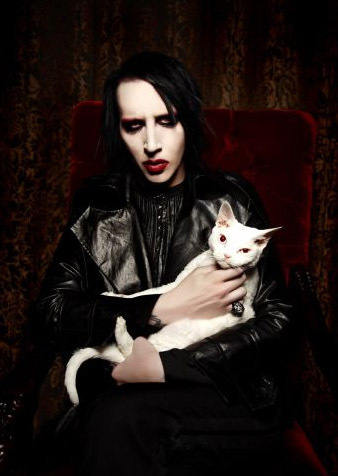 ), puts Manson and band at album number nine. It’s an intense work, highlighting Manson’s gruff and visceral vocals. A song such as “Cupid Carries a Gun,” (also the theme song for the excellent show, Salem) is a good example of what the record is all about. And why might it be excellent to see him at the Showbox? With its red decor and lighting, it can fit in with the industrial/rock ethos, and be an effective backdrop for Manson – and his fans. For tickets and more information, head over the Showbox’s event page. Written by: Dagmar on 03/24/2015. This entry was tagged marilyn manson, posted by dagmar, salem. Bookmark the permalink.